If you are interested in buying quality property on the Costa Blanca at the best price, take a look at this detached villa situated in a golf resort near the wonderful beaches of Guardamar del Segura. La Finca Golf is located a few minutes away from a large variety of supermarkets, restaurants, health centre, schools, sports and fitness centers and more. Within walking distance is a luxury hotel with spa facilities. In addition, the fabulous beach resort of Torrevieja is situated about 8 kilometers offering so many fun activities for children of all ages and adults of all interests. The international airports of Alicante and Murcia are just a 30 minutes' drive. 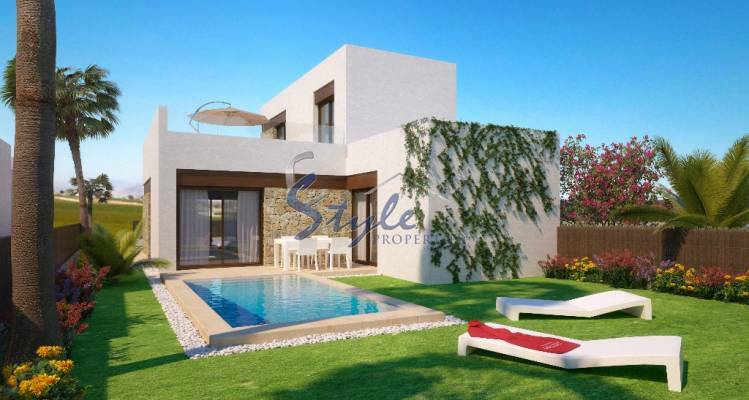 This new build detached villa for sale in La Finca Golf has 2 bedrooms, 2 bathrooms, living room, dining room, kitchen and a spacious terrace plus a small garden. The property has been built according to the latest standards with high quality materials. This is a great opportunity to buy Costa Blanca property in a wonderful location from 195,000€!